Today I have for you a light, refreshing salad with a little kick of heat and my favorite item, peanut butter. 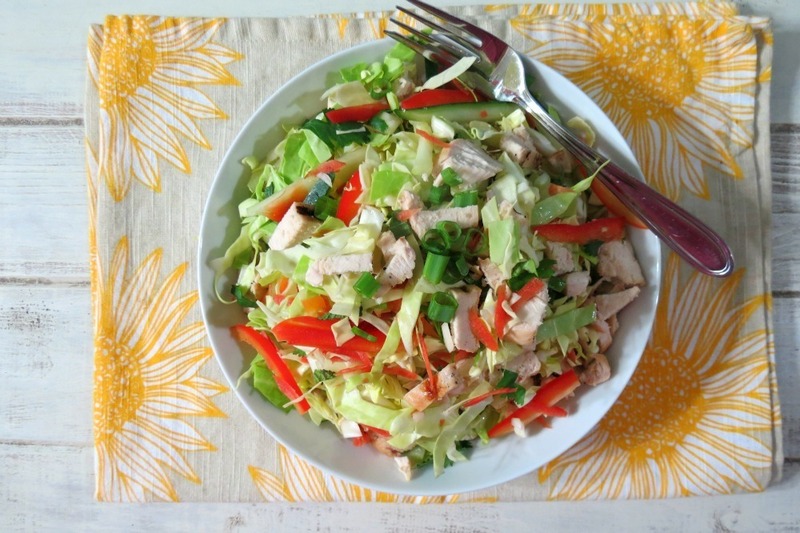 Yup you guessed it, I made a Spicy Thai Chicken Salad. This is one of my favorite salads. Just about anytime I go to a new restaurant and I am not sure what to order because of calories, I stick to my safe menu option, which is the Asian Salad. You really can’t go to wrong when ordering it, just get your dressing on the side and your pretty safe. I was so excited to make this salad, I had it in the back of my mind for weeks. Then one night my Husband said he was having frozen lasagna for dinner, since he bought a loaf of fresh Italian Bread. I didn’t argue one bit and said ok, have your lasagna and I knew what I was making. I LOVE fend for yourself nights!! We haven’t had to many of them lately, which I guess is a good thing. Trying to get my Husband on the healthy train. What inspired me to make this salad is that STAR Fine Foods sent me some infused olive oil. They come in 4 flavors, Grilling Garlic, Italian Basil, Mediterranean Chili Pepper and Asian Soy & Ginger. 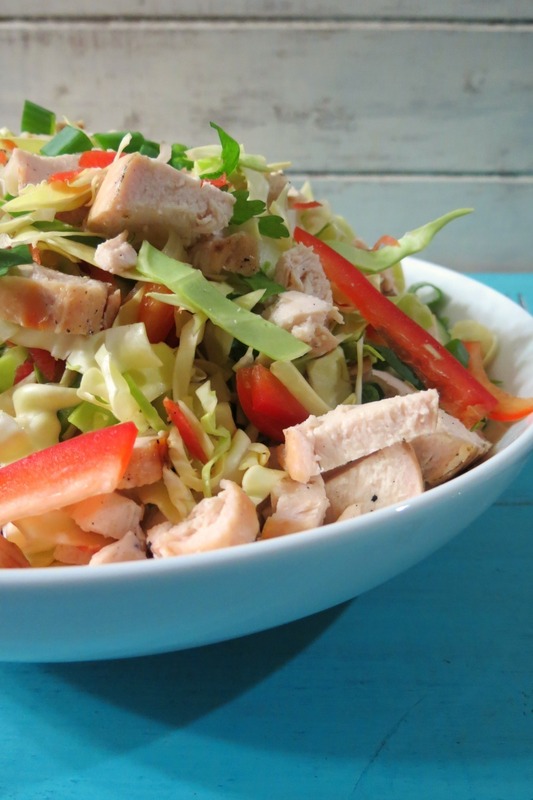 When I saw the Asian Soy & Ginger I knew immediately I was making this salad. I marinated my chicken in the Asian Soy & Ginger for about 30 minutes and then I popped my chicken on the grill. Oh man, did the chicken turn out so moist and delicious. It was just perfect! 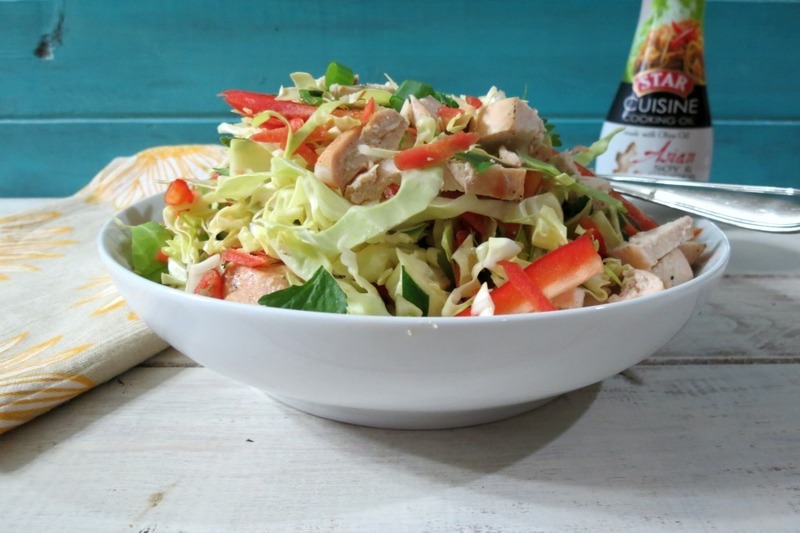 With one single ingredient this wonderful salad was made. 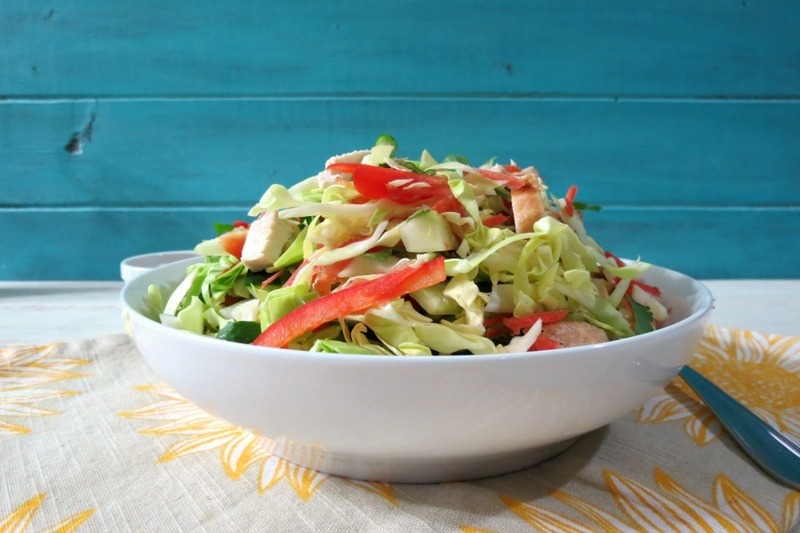 The salad is made of simple ingredients such as; cabbage, sweet bell pepper, carrots, cucumber, mint and cilantro. The mint in the salad gave it a nice light, summery taste that complimented the vegetables. As for the dressing I made a nice Thai Peanut Sauce. It is creamy from the peanut butter, a little bit sweet from the sugar, tangy from the rice vinegar and soy sauce and a tad spicy from the chili oil. Right at the end I added more chili oil, but left it light for you in the recipe. You can add more if you want a spicier dressing. I think I am in love with this sauce! I could literally drink it! I know crazy, but it’s made with peanut butter and has the most wonderful subtle peanut taste! 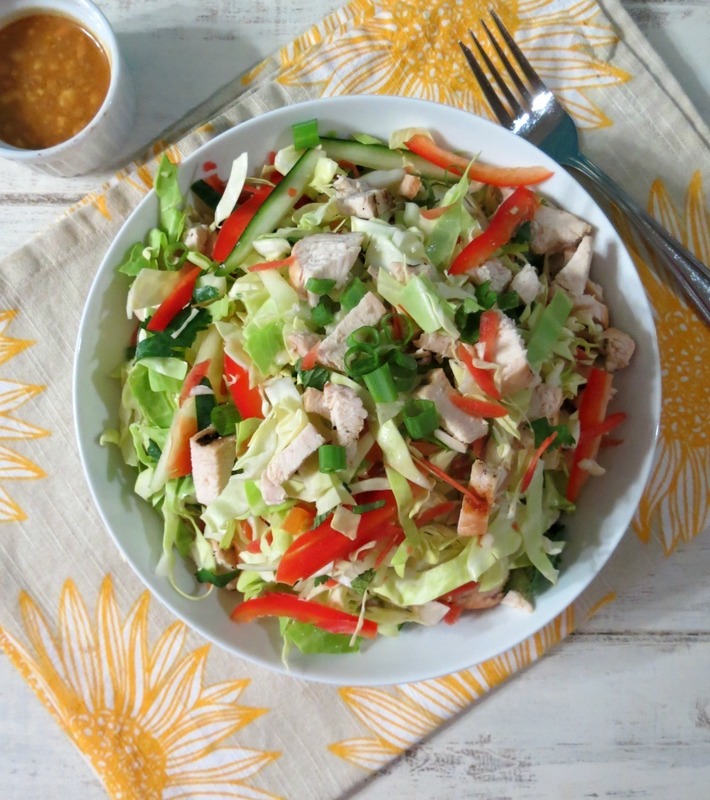 A healthy, light, refreshing Asian salad made with fresh vegetables and is served with a sweet and spicy peanut sauce. Brush chicken breasts with Asian Soy & Ginger Olive Oil and let it marinate for about 20 30 minutes in the refrigerator. Set the grill to medium heat and add the chicken. Cook chicken for about 5 minutes per side until no longer pink. Let the chicken cool and then finely chop it. Meanwhile, in a bowl add cabbage, carrots, cucumber, bell pepper, mint leaves and cilantro. Add the chicken and mix well. Divide between two plates. Top each plate with diced scallions. In a small bowl add all of the ingredients for the Thai Peanut Sauce, whisk together until combined and smooth. Add more chili oil for a spicier sauce. Pour dressing evenly between both salads. I have to tell you this recipe makes a lot of salad. My Husband saw my plate and said “are you really going to eat all that?” You bet I am! 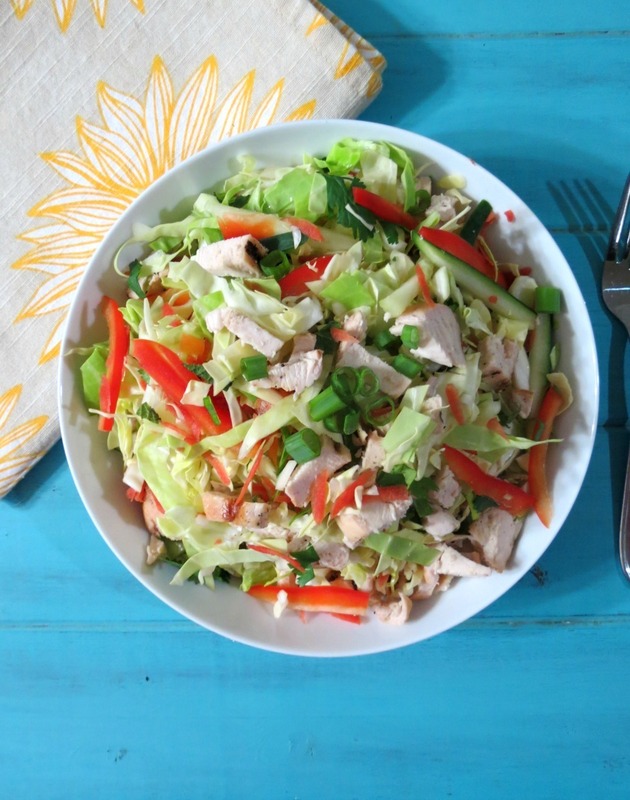 Since this recipe makes two salads, I ate one for dinner and took the other for lunch! Now I have a perfectly healthy lunch that will for sure fill me up and make me smile! Since I have over bought on produce, you can bet you will be getting more healthy vegetable recipes! I think I am off to a good start for January!! Looks just yummy. I bet this recipe would also be great if you substitute Trader Joe’s Savory or Teriyaki baked tofu, or even mushrooms! Oh ya! I bet you are so right!!! That sounds really good too!! Thats my kinda salad. Looks awesome. This salad looks divine! I love Asian-inspired recipes, and this is the perfect combo of sweet, spicy, healthy & refreshing. Must try this soon! Thanks Jennifer! If you try it let me know wheat you think. Such a colorful and vibrant salad Jennifer, I love everything about it. I’m like you, I could eat this kind of salad every day! The salad looks amazing. And that dressing – delicious. wonder if i can get my child to eat it for dinner this week. only one way to find out! Sounds delish Jennifer!!! YUM! I love Thai anything, the ginger oil sounds awesome!